If you feel like you have all of a sudden developed an allergy to certain types of foods, or even just feel a little less like yourself after your meals, you may have a food sensitivity. A food sensitivity is a low-grade reaction to certain types of foods that causes an inflammatory reaction within your body. Over time these foods can damage your gut and dysregulate your immune system, opening the doors to many health problems. 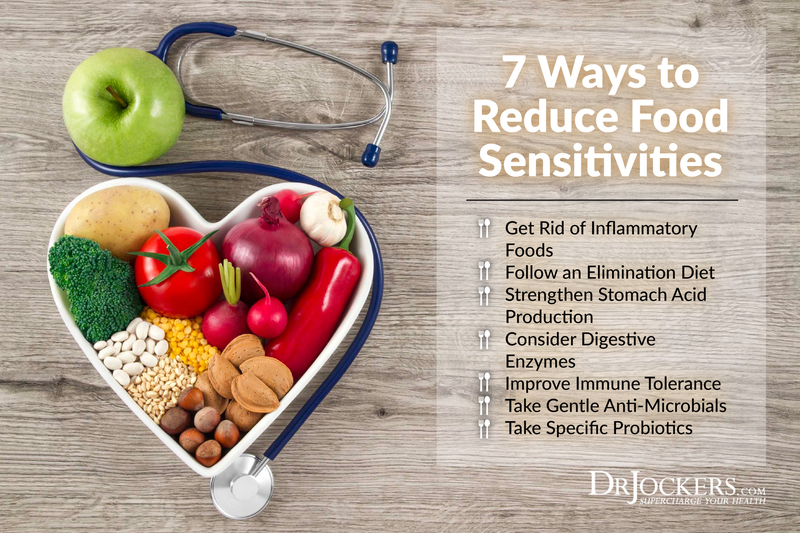 Food sensitivities are one of the first factors I address with my patients, so in this article I am going to break down 7 ways to reduce food sensitivities in your own body. 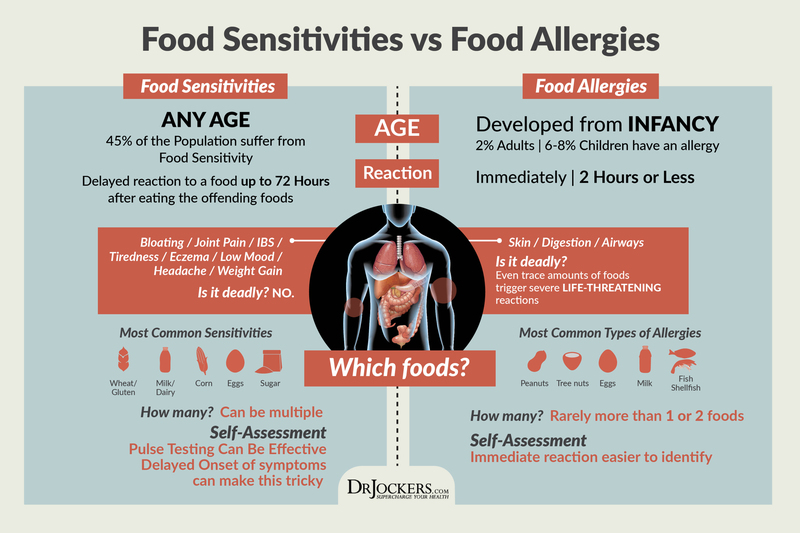 You may be familiar to the idea of a food allergy. This is when someone has an outright and obvious negative reaction to a certain food. We all know someone who has an allergy to peanuts or dairy for example. 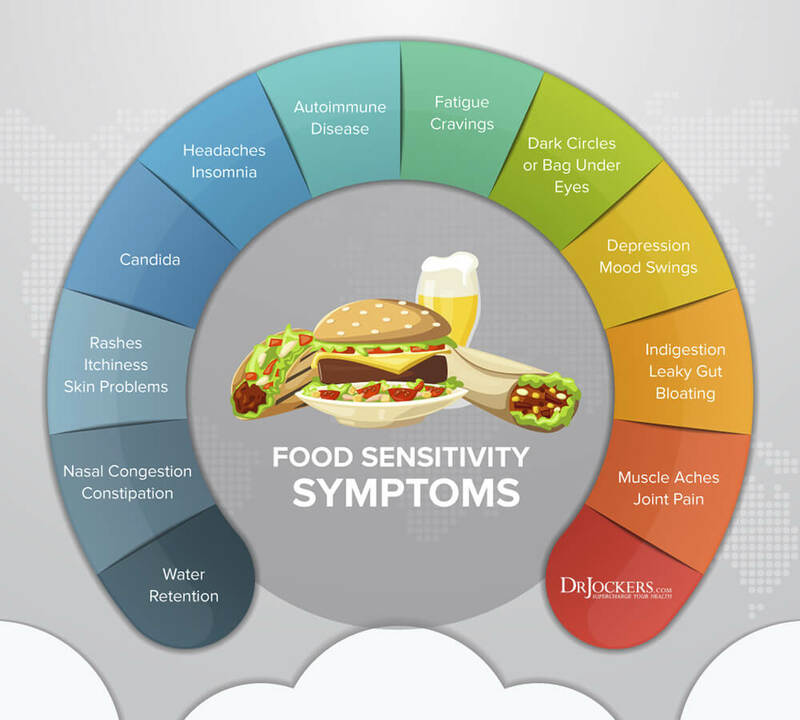 A food sensitivity however is an inflammatory reaction that can occur on a systemic level over time without you knowing it. Left unaddressed, it can eventually develop into an outright allergy due to leaky gut and possibly even auto-immunity. One of the most important things we can do is improve our digestive health to reduce food sensitivities. If you are experiencing any of these symptoms on a regular basis, you will likely want to take steps to remove common reactive foods and strengthen your body’s resilience against sensitivities. There are currently three main explanations for the negative reactions that occur in the body from specific foods. These reactions are classified as IgE, non-IgE, or IgG-mediated. The “Ig” in these abbreviations stand for “Immunoglobulin”. Immunoglobulins are important regulatory proteins in the immune system that regulate inflammatory reactions to strategically focus the immune system on specific targets such as viruses and foreign bacteria. In a classic allergic reaction where consuming a certain food, such as peanuts, can lead to a life-threatening reaction, you are looking at an IgE-mediated process. Non-IgE-mediated reactions are typically isolated to the gut and result in damage to the GI tract, gas/bloating, and potentially diarrhea. Non-IgE mediated reactions are thought to be largely influenced by the makeup of your gut bacteria (1). Finally, there are IgG-mediated reactions which are thought to be the primary culprit in food sensitivity development. Continued exposure to foods that elicit an IgG-mediated reaction can are now thought to cause systemic problems in the body over time and oftentimes develop into full-blown allergies if not addressed. The steps in this article are meant to help prevent this progression and strengthen your body’s defenses against these unwanted reactions to foods and reduce food sensitivities. The first step to reduce food sensitivities is to remove common inflammatory foods from the diet. How reactive you are to certain foods is heavily determined by the health of your gut. By removing common reactive foods for a period of time, you lessen the burden on your gut and allow it time to heal. You will definitely want to make sure you at least remove the foods listed above from your diet. If you want to take it a step further, I recommend following an elimination diet program. An elimination diet follows the initial principle outlined above by removing common reactive foods from the diet for a period of time. The next step, however, is to reintroduce these foods one at a time to identify which ones you are specifically reactive to. If you have a sensitivity to a food, your body will produce a stress response to it when you consume it. This will activate your sympathetic nervous system and drive your heart rate up. By reintroducing foods back into your diet and performing a pulse test, you can identify your unique food sensitivities for free! Check out my video below on how to perform a pulse test on yourself. If you want to strengthen your resilience against food sensitivities, you need to support your stomach acid. One of the big reasons you can get a reaction to a food is that you have a damaged, leaky gut. When you have leaky gut, undigested food particles get into your system. Once there, the immune system treats them as foreign invaders. Those larger molecules become stored in your immune system’s memory and every time you eat that food in the future you have an inflammatory response and this is oftentimes how someone can develop new food allergies (2). Unfortunately, the relationship between stomach acid and food sensitivities is actually a downward spiral. This is because inflammatory foods inhibit stomach acid production over time and low stomach acid inhibits your ability to fully break down those same foods. The result is continued damage, inhibited digestive processes, and continued release of undigested food particles into the blood stream. In addition to following the steps already mentioned, you may find it advantageous to use a stomach acid support supplement. This will help you fully digest your food while relieving stress from the digestive tract, assisting it in rebuilding. Meanwhile, you will want to support your own intrinsic formation of stomach acid by following the steps illustrated below. If you haven’t noticed so far, a lot of healing the gut has to do with removing as many stressors as possible. Removing reactive foods and taking steps to support proper digestion are critical here. On top of supporting stomach acid production, supplementing with a high quality digestive enzyme complex can be especially helpful in breaking down a variety of foods. Consequently, one of the common symptoms of low enzyme production is an increase in food sensitivities. Additionally, your immune, detoxification, as well as many other systems in the body rely on enzymes to carry out normal functions. Getting a broad range of enzymes into your body on a daily basis will help aid in rebalancing these processes. SuperDZyme is my personally developed enzymatic complex that I use for this purpose. For gut support, I would recommend consuming 2-4 capsules with each solid-food meal. Enzymes are also great for ongoing digestive support for everyday wellness and they are something I even use on a daily basis for the benefits outlined below. The damage that occurs in the gut over time due to inflammatory foods eventually leads to leaky gut. As I mentioned earlier, this allows large food molecules into the bloodstream that distract the immune system from real pathogenic threats. This means a lot of the inflammation caused by food sensitivities is actually due to unwarranted immune reactions. With this in mind, one of the best ways to increase your resilience against food sensitivities is to take steps to strengthen and coordinate your immune system. The top nutrients I have found for this purpose include: Quercetin, Curcumin, Zinc Glycinate, L-Glutamine, Ginger, and Pea Protein. You can purchase these ingredients individually; however, I have formulated a gut healing protein blend containing all of these nutrients that is specifically designed for restoring gut health and improving detoxification systems in the body that also serves as a powerful source of nutrition. As an additional strategy, colostrum is powerful immune support for the gut. Colostrum is a compound found in high concentrations in mother’s milk of most mammals. It contains important immunoglobulins that act to balance gut flora, reduce GI inflammation, and aid in healing the gut lining. For a concentrated source of gut healing immunoglobulins, I recommend Gut Defense. This product will improve the immune system of the gut and reduce food sensitivities. If you have unbalanced gut flora or have harmful pathogens in your gut, it is going to be difficult to reduce food sensitivities. 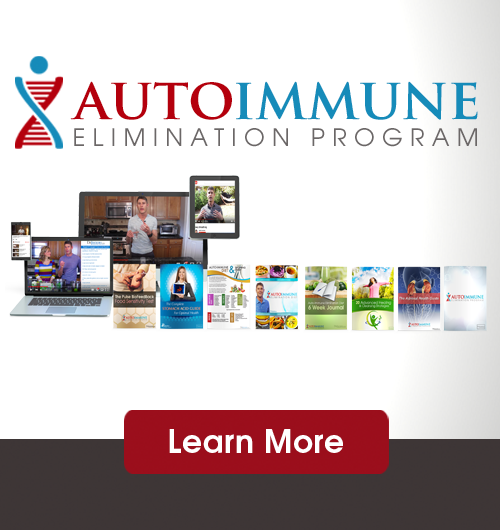 When pathogens are present in the gut, you will have continued inflammation and distraction of the immune system. My recommended strategy for this is to utilize gentle anti-microbial compounds on a daily basis to rebalance and maintain the microbiome of your GI tract. This includes things like: garlic, onions, fermented foods, Italian herbs (oregano, thyme, rosemary), lemon & lime juices, and apple cider vinegar. Essential oils such as oregano can also be very powerful for this. Alternatively, you could supplement with an anti-microbial supplement such as GI Regulator on a regular basis. This formula is a gentle and simple way to help rebalance your gut flora on a daily basis and reduce food sensitivities. There has been some interesting research showing that the microbiome of your gut can either potentiate or protect you from experiencing food sensitivities (3, 4). This makes sense as the microbes in your gut interact with every bite of food that you eat. Things like antibiotic use, exposure to damaging chemicals, processed foods, spending too much time in a sterilized environment, and even being formula fed as a child can all alter the microbiome in a way that increases your likelihood of suffering from food allergies. The presence of specific strains of bacteria in the gut such as: Lactobacilli, Saccharomyces boulardii, Bacillus coagulans, and L. acidophilus have all shown to play some role in reducing food sensitivities and restoring a healthy microbial environment in the gut (5, 6). At the same time, probiotics have been shown to help restore the integrity of the gut lining which is also an important step for reducing sensitivity (7). Our SBO probiotic is a great source of these sensitivity-reducing probiotic strains as is the probiocharge probiotics. I will typically have people do 3 month periods on each of them and continue to rotate them so they get the microbial diversity needed for an optimal microbiome to reduce food sensitivities. 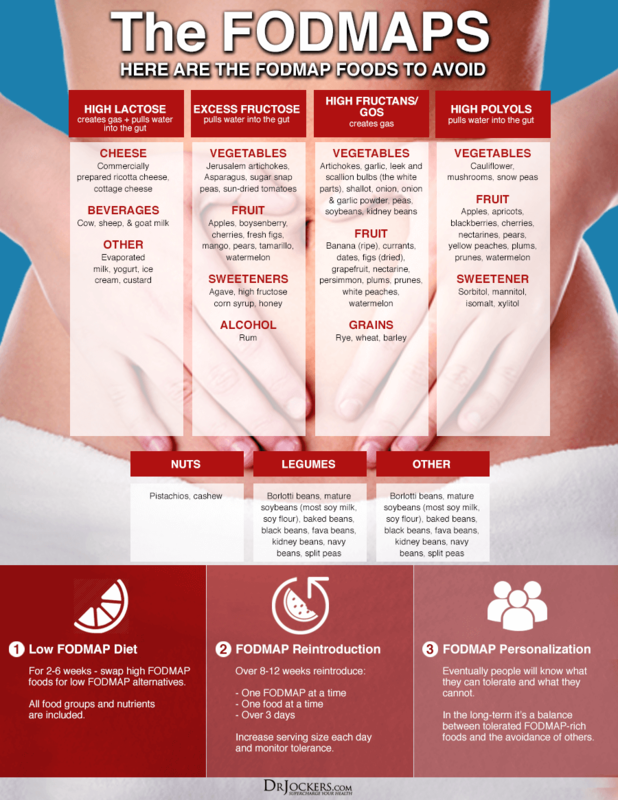 FODMAP stands for Fermentable Oligo, Di- and Monosaccharides and Polyols. While this sounds complicated, these are just compounds that occur in specific types of foods. If you are someone with an imbalance in your gut bacteria, especially in the small intestine, you will likely react negatively to FODMAP foods. If you have small intestinal bacterial overgrowth (SIBO), I would recommend eliminating FODMAP foods for a short amount of time to help restore balance in the small intestine. Take a look at the chart below. If you notice that after consuming any of the following foods that you consistently get diarrhea and flatulence, it may be advantageous for you to remove FODMAPs from your diet. During this time, it would be a good idea consume anti-microbials, L-glutamine and nourishing foods like bone broth. These things help the body to heal and reduce food sensitivities. Allergies can often be potentiated or caused by elevated histamine in the body. Histamine is an important inflammatory molecule that plays a role in regulating immunity. In some individuals however, elevated histamine or improper histamine metabolism can lead to exaggerated reactions to different environmental factors, such as food compounds. These people will usually know whether or not they are histamine intolerant. They are often very reactive to things like fermented foods and some even report being allergic to the sun! In this case, it is very important to reduce your exposure to histamine-raising foods while also taking steps to improve your metabolism of histamines. Many of the steps outlined in this article will help improve your histamine response and reduce food sensitivities. You can read more about histamine intolerance here. Clinically, I have found the biggest factor that needs to be addressed with individuals with multiple food sensitivities that don’t seem to go away is chronic gut infections. The most common infections my team and I see on a daily basis on labs include H Pylori, Candida overgrowth, bad bacterial overgrowths and parasites. If you follow an elimination diet and never address these gut infections, you will never fully get well. I tell people to follow an elimination diet for 3 months and see how your body responds. 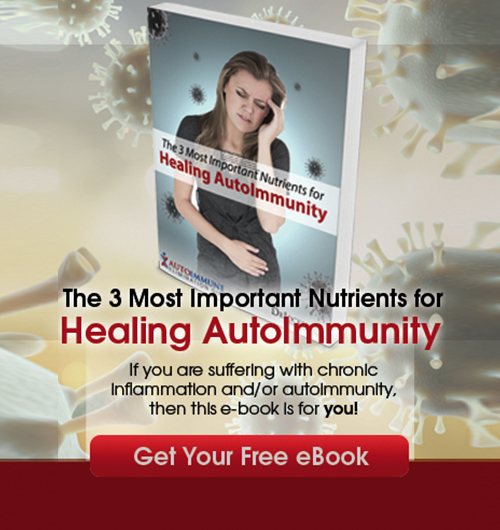 If you have reached a healing plateau than you most likely have either a micronutrient deficiency or a chronic infection (or both) that is holding you back and needs to be addressed. I highly recommend the GI MAP stool analysis as the best testing method for gut infections and the status of the intestinal immune system. If you have chronic food sensitivities, I would highly encourage you to get this test run and let one of my team of health coaches work to customize a plan for you to get well. Having a plan to reduce gut infections will help you reduce food sensitivities and improve your health and quality of life. Sinus challenges, allergies, and joint aches. Tried this with pulse oximeter before watching this when I ate or drank. Everything caused increase of at least 8. Even water. That is interesting, never heard of that J! Gluten is wheat/barley/rye..oats/corn/rice. When I took white rice away from my cats they got shiny fur and my older cat got healthier. Gluten may be hidden in nuts not sold in the shell/meat basting/some spices/air/lotions/food with a label etc. Grain free may help people/pets. This is great information! Is there a pulse meter I can use for greater accuracy? It seems that the margin of error could be a factor for this type of self testing, as there’s only a difference of a few beats, and you could easily miss the one minute mark by a few moments. I am sure there are many great tools available for that Kristine! When doing the pulse test, is it best to do it on an empty stomach or does that matter? Also do you need to wait a certain amount of time between each test? On an empty stomach would be best as heart rate will change during digestion and may cause iffy results! I would recommend testing one food a day or repeating the test for the same food on separate days for confirmation! I don’t have a problem with fermented foods but acv destroys my gut. What’s up with that?